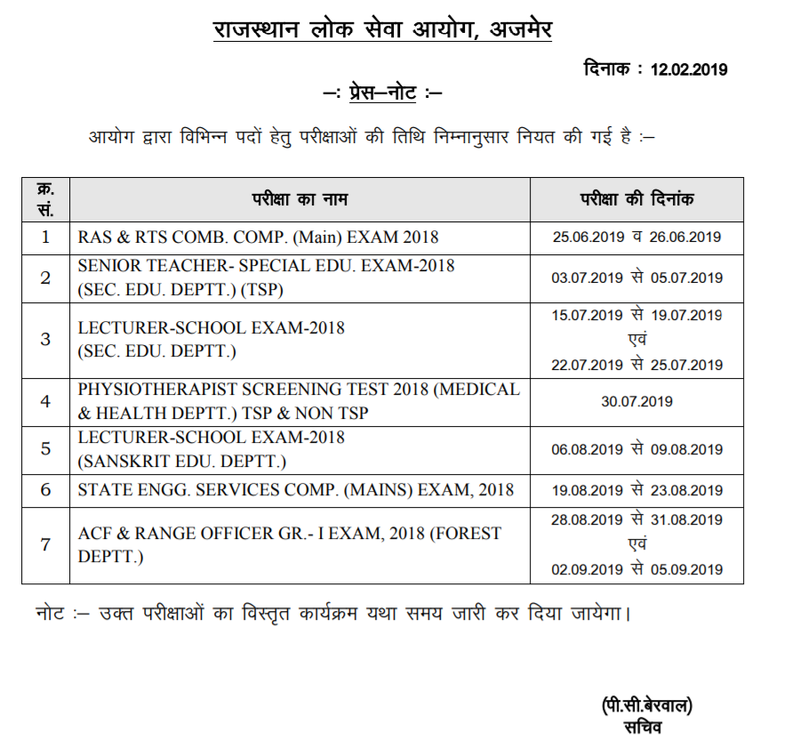 OBC Creamy Layer Limit in Rajasthan 2019, Updated Current: Rajasthan Cabinet on 13th February 2019 passed Rajasthan Backward Classes (Reservation of Seats in Educational Institutions in the State and of Appointments and Posts in Services under the State) (Amendment) Bill, 2019. This bill provides 5% reservation to Gurjar and other communities along with raising the OBC Creamy layer limit from current Rs 2.5 lakh to Rs 8 lakh per annum. OBC Creamy Layer Limit in Rajasthan from February 2019 is 8 Lakh per year. Now anyone with Annual income above 8 Lakh will be considered as OBC-Creamy Layer or General candidate and will not be eligible for OBC reservation in Rajasthan. So to Get OBC Reservation your family income should be below 8 Lakh so that candidate will fall under OBC-Non Creamy Layer or OBC. RPSC, Ajmer on 12th February 2019 issued press note for RAS & RTS Comb. comp. Main exam 2018 date which is 25th June and 26th June 2019. RPSC Ajmer also issued exam date for Sr. Teacher, Lecturer School exam 2018, state engineering exam and other exam as shown in below press note. 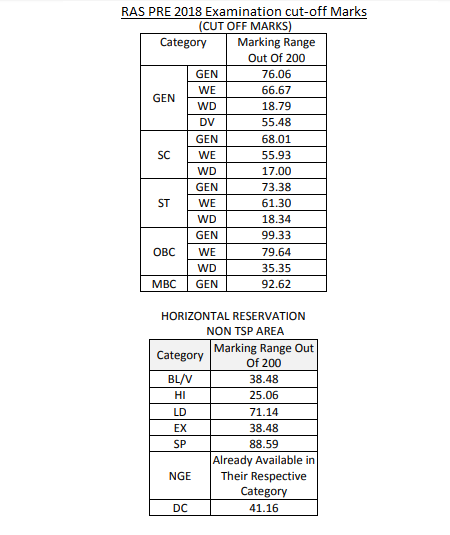 RAS PRE 2018, Cut Off Marks once again raised the Question on Reservation system when OBC Cutoff is 24 Marks higher then GEN candidates so Candidates scoring Higher marks are rejected with General and OBC-Creamy Layer candidates with lower score qualify for mains, which is raising question on the concept and soul of Reservation for poor and needful candidates. RAS Pre 2018 Paper, Answer Key, Cut-Off Marks, Solutions: RAS Pre 2018 Examination held today, 5th August at verious centers across Rajasthan. Here is Full RAS 2018 Question Paper, Answer Key, Expected Cut-Off Marks and Solutions of Questions. You can also share answers in comment. RAS Pre 2018 Expected Cut-Off Marks: As paper was somewhat difficult and not too much edge to science, Maths or engineering students so we expect low cut-off marks this year. Here is our prediction for RAS Pre 2018.